Most contact lens wearers probably don’t know that what they’re doing is risky, doctors warn. The next time you’re tempted to go swimming or take a shower while wearing contact lenses, Stacey Peoples wants you to remember her ordeal. 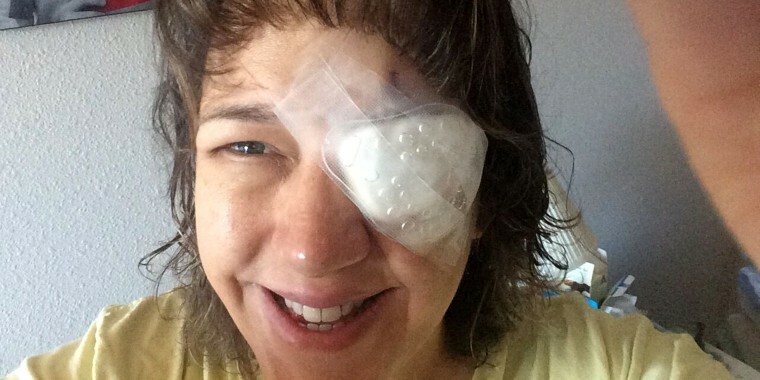 The veteran educator in suburban Denver, Colorado, went blind in one eye and suffered pain so excruciating that she considered killing herself after she was exposed to a parasite while swimming in her contacts. The infection from the microscopic organism, called Acanthamoeba, is rare, but any kind of water exposure when you’re wearing soft contact lenses puts you at risk, doctors say. “People want to say, ‘Not me, it won’t happen to me.’ But I’m here to tell you, it can happen to you,” Peoples, 49, told TODAY. “Our warning is: Contact lenses and water don’t mix,” said Dr. Thomas Steinemann, a clinical spokesman for the American Academy of Ophthalmology. That includes tap water and chlorinated pool water, which might be treated and safe to drink or swim in, but which is still not sterile, Steinemann noted. Like many contact lens wearers, Peoples wasn’t aware of the risk. She’d been wearing contacts for over 20 years and wore her daily disposable pair when she went swimming with her son over Memorial Day weekend in 2014. The problems began about a week later. When her left eye became itchy, red and painful, her doctor told her it was pink eye. But things just kept getting worse and the diagnosis kept changing: Peoples was told at various points she was allergic to antibiotic drops, had a scratch on her cornea and had herpes in the eye. In July, she lost vision in her eye. A cornea specialist finally diagnosed her with Acanthamoeba keratitis, a serious infection of the cornea caused by the parasite. By that point, the pain had become excruciating, Peoples said. Exquisitely sensitive to light, Peoples had to stay in a dark room where she couldn’t read or watch TV. She couldn’t work or drive. Her low point came when she began spending time curled up in a fetal position. “I was suicidal for a couple of days. If I had not had family and incredible support, I’m not sure what would have happened,” she said. Soft contact lenses can act like a sponge, so they absorb water, including common impurities in the water such as Acanthamoeba, Steinemann said. When the organisms jump onto the contact lens, it becomes their portal of entry into the part of the eye the contact lens fits on — the cornea. In the U.S., the overwhelming majority of people who get the infection — 85 percent — are contact lens wearers, according to the Centers for Disease Control and Prevention. It's so rare that it's estimated there are only a few cases of the infection per million contact lens users. Most probably don’t know that what they’re doing is risky, Steinemann noted. Peoples’ experience of being misdiagnosed was not unusual, he noted. An eye exam just won’t reveal much at first. “Many times, we are fooled by this organism. It’s a very crafty, if you will, organism. It’s very hardy and it’s very hard to diagnose early on,” Steinemann said. The key symptom is pain out of proportion to the findings of the exam. Once the parasite enters the eye, it can burrow deeper and deeper, making the cornea — which is normally crystal clear — cloudy and the infection more difficult to treat. People can go blind or even lose an eye. The cornea is made out of collagen and has no blood supply, so doctors can’t give the patient antibiotics, Steinemann said. The treatment involves special drops that must be used several times a day for months. Peoples called them “acid drops” because they were almost as bad as the eye pain, she said. She had to use the drops for almost 15 months to make sure the parasite, which can live in a dormant state, was completely gone. In early 2015, she became a candidate for a cornea transplant. When the doctor lifted the bandage, she cried. “It was a true miracle. I could see,” she recalled. Today, Peoples has normal vision with glasses and won’t go near contacts. Her story recently began receiving attention after her school profiled her ordeal on its website last month. She has two main messages to others: Don’t let water touch your contacts — it only takes one drop to get infected, she said. And consider signing up to be a cornea donor. “(The transplant) gave me my life back,” Peoples said. Don’t shower in your lenses or swim in them, whether in a pool, hot tub, river or sea. If you do swim in them, take your contacts out and disinfect them when you get out of the water. If you wear single-use lenses, throw them away when you get out of the water. “The risk is not high — Acanthamoeba is not common, but if you get it, you’re out of luck because it’s extremely hard to diagnose and treat,” Steinemann said.